Paddling, rock climbing, fishing, camping on an island, visiting historic places, and enjoying the fall scenery....how much better can it get? About a month ago I had the pleasure of being invited on a 3 day trip to the Adirondacks, specifically Lake George. I eagerly accepted the invite and a couple weeks later Keith, Andy, and I were headed northwest. Packed for just about everything you can imagine, we meandered through the Green Mountains of Vermont and across the New York border to Ticonderoga. 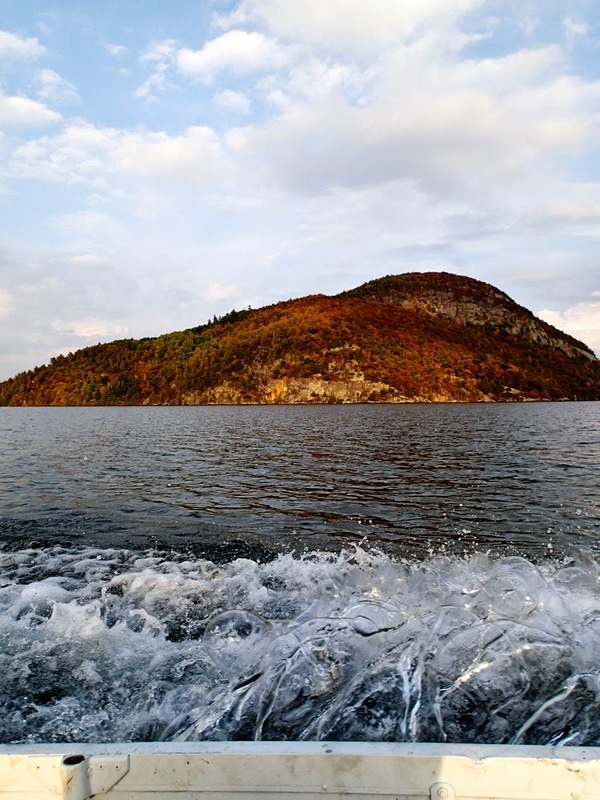 It is not only home to the famous fort, but also separates Lake George and Lake Champlain via the La Chute River. We then turned south on Route 9 and made our way to Rogers Rock Campground. From there, our adventure began! This wasn't your ordinary camping trip. Car camping, which we all admitted we thoroughly enjoy despite also being backpackers, was not going to work. Instead of a campsite you could pull up to and unload, our site was 2.5 miles from the campground - on a small island in the middle of the lake. Before the trip, we had planned to only have 3 kayaks with which to haul all of our gear and supplies. I tried to mentally prepare for that, but I'm not sure it really sank in just how much gear we had and how far 2.5 miles of big water can be with a boat loaded to the gills. But at the last minute, we were saved. Andy pulled an early moring audible and decided to bring his 14' jon boat and 9 HP motor. Originally, I remember slightly bulking at the idea of bringing a motor boat on our kayaking trip. In hindsight, he was clearly the smartest of the group and I was awfully glad he brought the horsepower. I did manage to fit all of my personal gear and some of the food into my Malibu Stealth 12. I was pretty proud of that. But there was a lot of group gear that went directly into the jon boat. Miraculously, the wind was fairly mellow on our paddle out and we casually made our way to our island retreat, soaking in the scenery along the way. The water was very clear - with roughly 12 feet of visibility in many spots. We also spotted 'Rogers Rock', our climbing destination for the next day, got to observe a few beautiful wooden boats from up close, and enjoyed the fall colors. The island greeted us with a wooden dock, small beach, and large bedrock outcrops. It was bigger and nicer than we had imagined and we eagerly set up camp. The MK Stealth 12 - loaded and ready to go! Bit by the explorer bug, we grabbed a quick snack and headed for the water. For me, of course, it was time to do some fishing. Keith and Andy paddled around some islands, snapped some photos, and soaked it in. Unfortunately, the grass in that part of the lake was already going dormant and the bottom was mainly composed of sand - neither of which are terribly conducive to bass fishing. I had spotted a rock pile in about 10 feet of water just across a small bay on the paddle in. I paddled back to it and it wasn't long before I landed a short bass...a humble start. Not having a depthfinder was killing me, as I suspect there were more offshore rock piles and structure in the area that I couldn't see. Instead I focused on what I could - rocky points, docks, and weed clumps. The only consistent bite was the weed clump bite. They were few and far between, but every time I found one, I got bit. Most were small largemouths that ate finesse worms in a green pumpkin color. But the last fish of the evening was a chunky 14-incher that put up a healthy fight. It was my last cast before dinner. 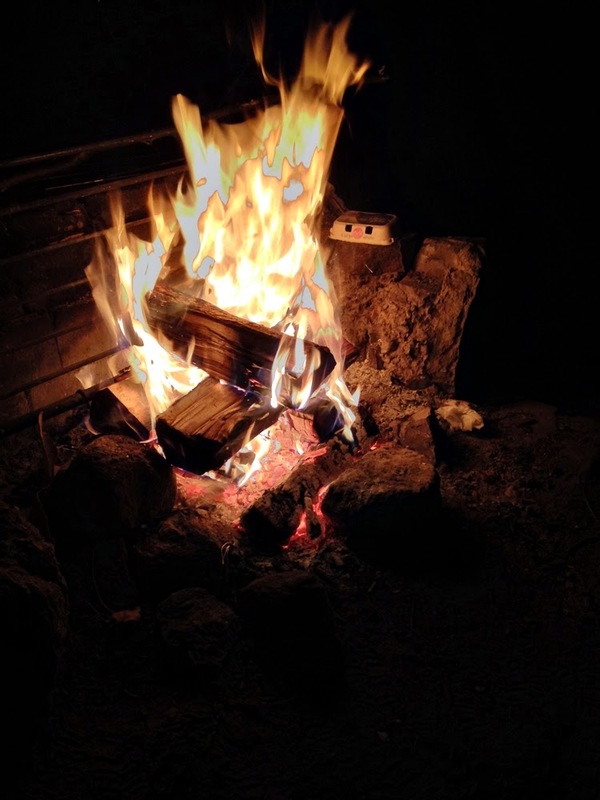 Usually it is hard for me to put down the fishing rod to go eat, but I was insanely hungry and tired and Mexican spiced chicken tacos over the fire were screaming my name. We ate, drank, and sat around camp for a few hours before turning in. Despite nightly temps in the high-40's, I slept like a baby. 7 AM arrived before I knew it and it was time for a hearty camp breakfast - you the know the kind you only eat when camping/hiking/paddling/climbing because they are loaded with delicious protein and fat. After some debate, we opted to pack all of our gear in the jon boat and take it on our climbing excursion rather than making the 3 mile paddle. We would have fought the wind most of the way there and none of us were keen on paddling back after an exhausting climb up a 500 foot slab. So we motored over, beached the boat (which required more effort than I just made it seem), and started to get set-up. Having not climbed, other than indoor rock gyms, since I left New Mexico back in 2008, I was chomping at the bit with excitement. 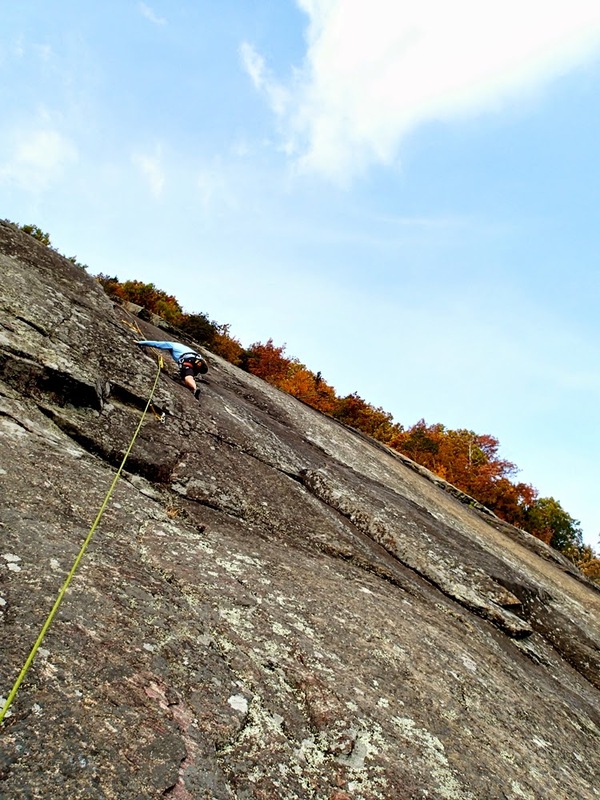 The day was full of learning for me - as I tried to soak up as much knowledge as possible from Andy (the manager at Central Rock Gym in Hadley, MA) and Keith (the manager at Zoar Outdoor in Wilmington, VT). They were great teachers and kept a smile on my face all day. The rock had some easier sections and some more challenging pieces, but we made it up all three sections without any issues. I must admit that after the first section, I didn't want to look down...it was freaky. But by the end of the second section, I was feeling more confident and starting to get comfortable with the height. It was also at the end of section 2 when Andy found a hazardous hold on a very loose rock. He carefully avoided it and pointed it out to us, so that we could also avoid it. After we were all anchored in above it, we decided to break it off, so that it would not be dangerous for others in the future. We made sure that no-one was below and Keith gave it a shove. Initially, it was headed straight over a steep cliff and into the water below. Then, it made an abrupt right and was headed directly for some of the gear we had left on the ground below. SMASH! The air was full of profanities for the next few minutes as we soaked it what had just happened. We weren't sure whether it had hit our stuff or not, but it was awfully close. All we could do was laugh about it, but we were eager to see the potential damage. At the top, we spent about 40 minutes enjoying the view and eating some lunch. Spectator boats had begun to gather and gawk at the three crazies tethered to the cliff. Then came the descent - a three section repel back to the bottom. Walking backward down a cliff always takes about 20-30 feet before you start to get the butterflies worked out. Then it gets fun. Before we knew it, we were back at the base of the rock. Immediately, we checked the gear. You could see major impact potholes 6-12 inches from our bags where the rock had come smashing down. Smaller rocks that had broken off of the larger piece actually managed to put holes in a new rope bag. It was a close call, and a fun story. We marveled at the craziness of bringing kayaks as we hopped back in the jon boat. That night we feasted on venison steaks, onions, mushrooms, and creamy risotto, washed down with a few local brews. Andy even went for a swim. It was good to be us. I was awakened early the next morning by a strong wind, a heavy mist, and waves slapping against the rocky shore. I cringed thinking of the paddle back to the launch. I think we all did as we ate and broke camp. Our island was slightly protected and I worried that when we got around the first point, we would be met with whitecaps and dangerous conditions. Still, I loaded up my Stealth and grit my teeth. I began my paddle, given that my boat was the slowest, and made it to the first point before the others had left the island. The wind was raging and although the waves weren't huge, they were big enough to make me re-think my decision. So I turned around. Rather than getting in the jon boat, I pridefully decided to trade out my kayak for the spare sea kayak. So we switched the tow rope onto my boat and I got in the tourer. It was my first time ever paddling a true tourer. What a way to start. Keith, who was in a tourer of his own, gave me some quick tips and I began the journey to shore. I was motivated by the fact that you feel much more stable at high speeds than you do at slow speeds. But cutting the wind and paddling a straight line simultaneously was difficult. After about 2 miles, my body was ready to stop. It was a true mental challenge to keep going, but I kept grinding and eventually pulled up to the dock. I eagerly sprung from the boat and stretched. Visions of milkshakes danced through my mind. Never in my life have I loved and hated a boat so much at the same time. We lethargically loaded the cars and hit the road, winding back through western New York after a great trip. I was in need of a good outdoor adventure and the Adirondacks proved to be just that. MM and the dogs welcomed me home and we feasted on cornbread and our famous venison chili. Despite sleeping well in the tent, I absolutely crashed when my head hit the pillow that night. A huge thanks to Keith and Andy for inviting me on the trip. Hopefully we can do it again soon! Tight lines! 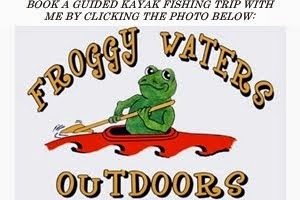 There are tons involving models of kayaks that one could take into account before you go directly into kayaking, read about it here http://blogs.naturalnews.com/becoming-better-person-travel/ Kayaks may usually possibly be categorized because discretion kayaks, fishing kayaks, search enjoy kayaks as well as kayaks on trip.